I’ve noticed quite a few people have already visited and read the page titled The Life Story Of Jody Michael Wirawan in the last week. I just wanted to say thanks for stopping by that page and reading about Jody’s life, it’s such a heartwarming thing to see! 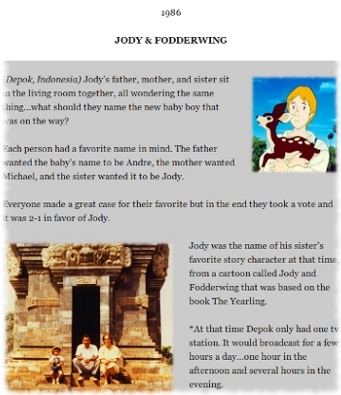 Although Jody’s life story is on the page in full, not all the pictures are in yet…so I was pleasantly surprised to see so many people reading through it already. I promise I’ll put in the rest of the pictures soon and maybe even put in more about Jody’s life in some of the blocks. When it’s all finished I’ll post about it on the News page so keep an eye out :). In the meantime if you want to check out the page about Jody’s Life Story just click the picture and it’ll take you there. Thanks again everybody, love you guys!